Housewarming gifts that are surprising, pratical and unique. Housewarming gifts that are unique and special. For most of us moving house is a very stressful time. Most people dislike change and uncertainty. And there is a lot of stress involved. Things need to be packed by a certain date. Will the removalists show up at the arranged time? Will my things arrive in one piece? And once you are in your new home, you will need to unpack and find a new place for all your possessions. We have all experienced this upheaval and can sympathise with a friend or relative when they move home and are likely to experience some negative emotions. Which brings us to your assistance once the dust has settled. Often mental or physical support is a great help. Great practical housewarming gifts say even more. It says that ‘I am thinking of you and have given your gift a deal of thought’. Pingi Moisture Absorbers make wonderful housewarming gifts. Because of the very wide application of our Moisture Absorber Product range, almost everybody can find a use for our Pingi housewarming gifts. Here is a product that not only looks cute, but is designed to keep confined spaces dry and prevent mould incubation. Help your friend or relative to store his/her clothes, Manchester and and and ….. in a dry environment in their new home. Our online housewarming gifts are postage free in Australia. Many of our customers have already given Pingis to others as a gift. 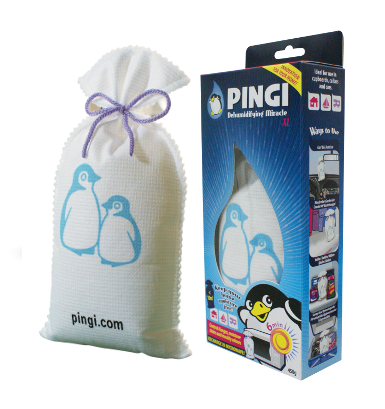 Order your PINGI at our Shop today!